People generally switch jobs by quitting (rather than losing) their previous job. Furthermore, the vast majority of people observed quitting their job tend to move directly to a new job, rather than becoming unemployed or exiting the labor force. Therefore, estimates of worker quits provide a good measure of job switching in the U.S. economy. Data from the Job Openings and Labor Turnover Survey (JOLTS) provide an estimate of the aggregate quit rate each month for the U.S. economy since 2000. Recent research by Steven Davis, R. Jason Faberman, and John Haltiwanger has extended the JOLTS data series back to the early 1990s. Their work shows that quits are highly procyclical. That is, they rise during expansions and fall during recessions. Figure 1 plots the year-over-year percentage change in the wage component of the Employment Compensation Index (ECI, dashed line), together with the quit rate (solid line). Both the quit rate and this measure of wage growth are quite procyclical and exhibit strong co-movement. 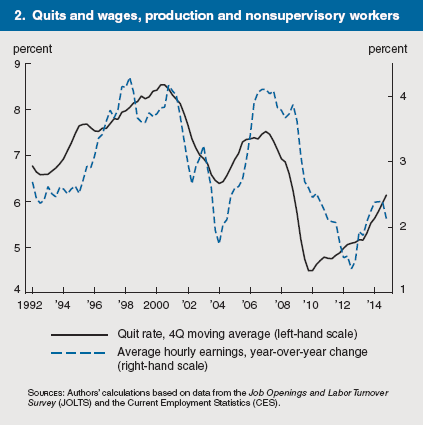 Moreover, fluctuations in the quit rate seem to precede fluctuations in wage growth by roughly one to two quarters, suggesting that quits may be a useful predictor of future wage growth. Figure 2 plots the quit rate against an alternative measure of wage growth using the average hourly earnings of production and nonsupervisory workers (dashed line). 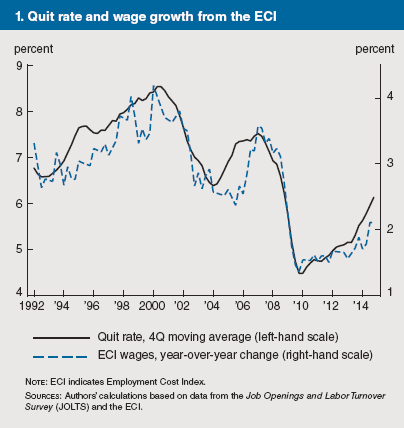 Wage growth and the quit rate continue to co-move over time, albeit less strongly than in figure 1, and both series exhibit strong procyclical patterns. I fail to see evidence of the claim "fluctuations in the quit rate seem to precede fluctuations in wage growth by roughly one to two quarters, suggesting that quits may be a useful predictor of future wage growth." 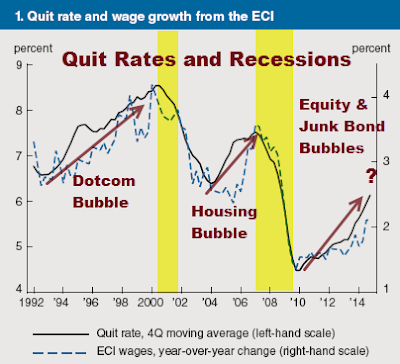 In 2009, wages turned up before quit rates. In 1992 they appeared at roughly the same time. And in 2003, wages ticked up years after quit rates. I would like to see data for more years, but Fred (the Federal Reserve Economic Data) repository only dates back to 2000. Somehow the authors have more years of data. What caught my eye was something missing from the above charts: Recession bars. Note that between 2002 and 2004, quits fell during an expansion. Quits tend to peak just before all hell breaks loose. That's certainly something to consider if you are thinking of quitting your job for greener pastures.